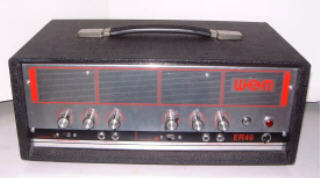 Introduced during the later part of the 1960s, the ER40 was a solid-state model with similar features to the ER30. It seems that the valve ER15, ER30 and HR30 were dropped in favour of the larger solid-state ER40 and ER100 at some point. It had 2 channels each with 2 inputs, treble-boost slide switches, and bass, treble & volume controls. Recommended speaker cabinets were the Dual 12, Super Dual 12 or Super 40. Tim Remembers.......... "We had one of these in the late 60s : our the lead guitarist bought it along with a couple of 2 x 12" (I think) cabs to use as a guitar amp, but he didn't like it and it ended up as our PA. It actually made a very good PA (by schoolboy standards), I suspect because it's probably very similar to the PA40."